Nissan’s been working hard to cut costs on its Leaf EV, and now consumers will see some of the benefits. 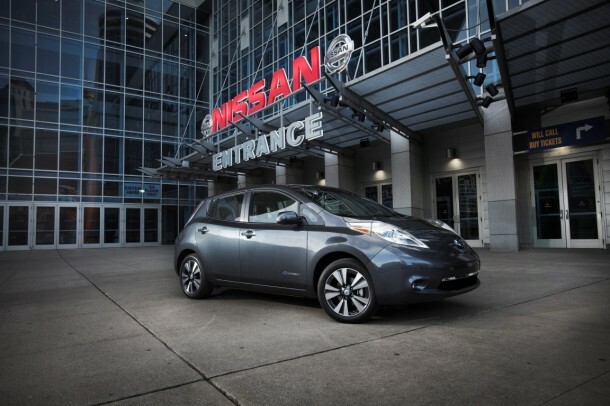 With U.S. production of the revised 2013 Leaf ramping up, Nissan has announced a major price cut — the base price is down by $6,400 to $28,800 ($21,300 after the $7,500 federal EV tax credit). 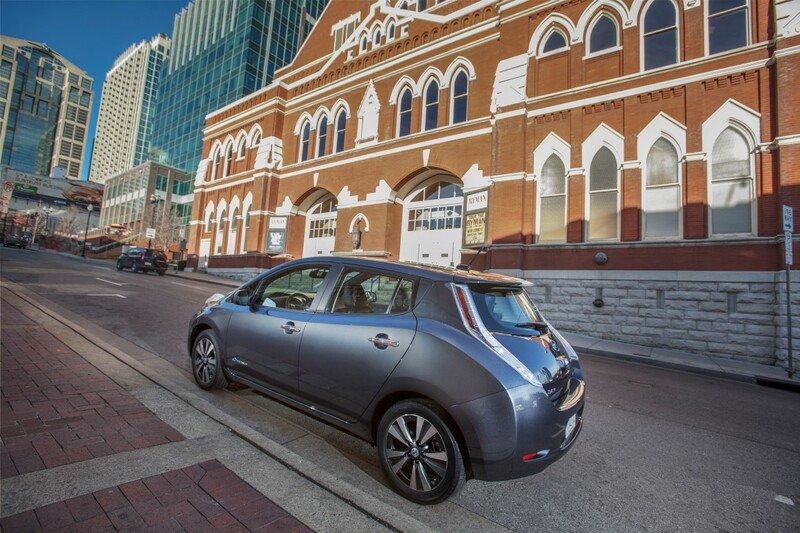 That makes the Leaf the cheapest 5-seat EV sold in America (the Smart Electric Drive is cheaper, at $25,000, but it’s a 2-seater). 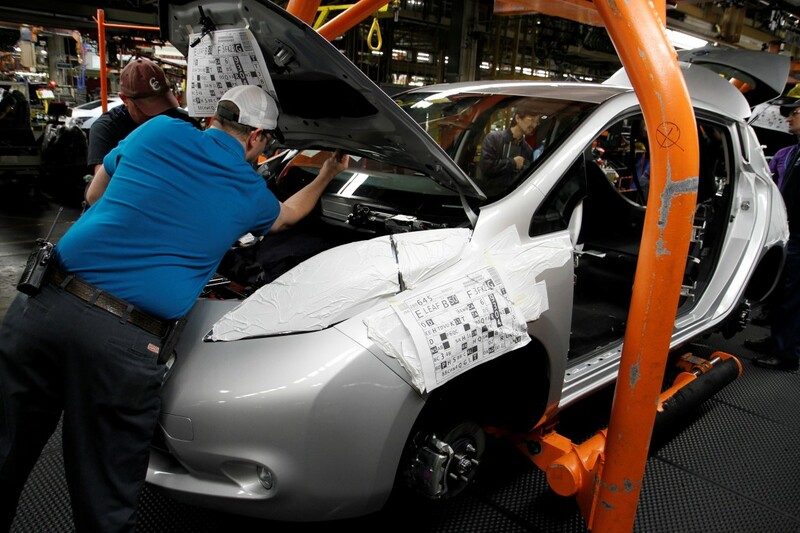 Nissan’s Smyrna, Tennessee factory builds the 2013 Leaf on the same line as the gas-powered Altima and Maxima sedans, and nearby plants produce both the Leaf’s motor and the lithium-ion cells for its battery pack. 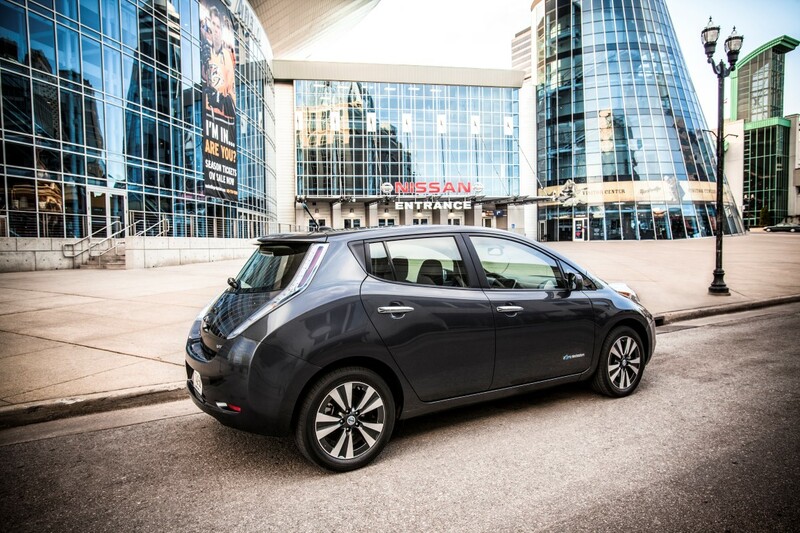 Nissan can produce 150,000 Leafs and 200,000 batteries annually in Tennessee. Nissan says the 2013 Leaf will have slightly more driving range than the 2012 model, due to better aerodynamics (drag coefficient cut from 0.29 to 0.28), regenerative braking, and energy management. New options include 6.6 kW charger, leather seats, black upholstery, two new exterior colors, new alloy wheels, longer sun visors, and a leather-wrapped steering wheel. 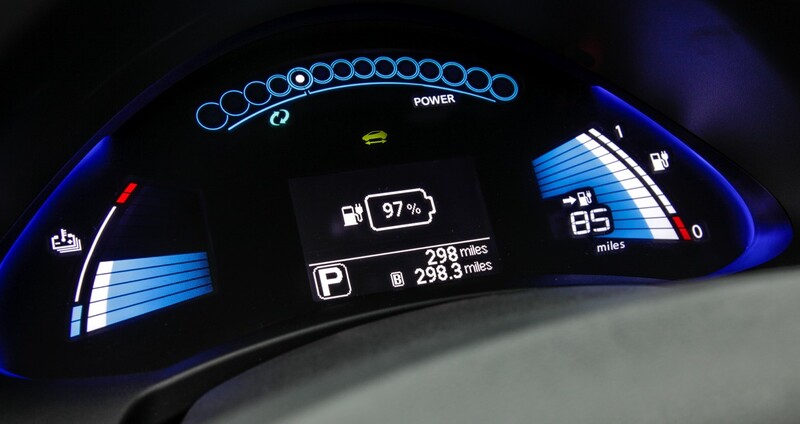 The trip computer, which used to only show a bar graph for battery charge, now also gives a state-of-charge percentage. 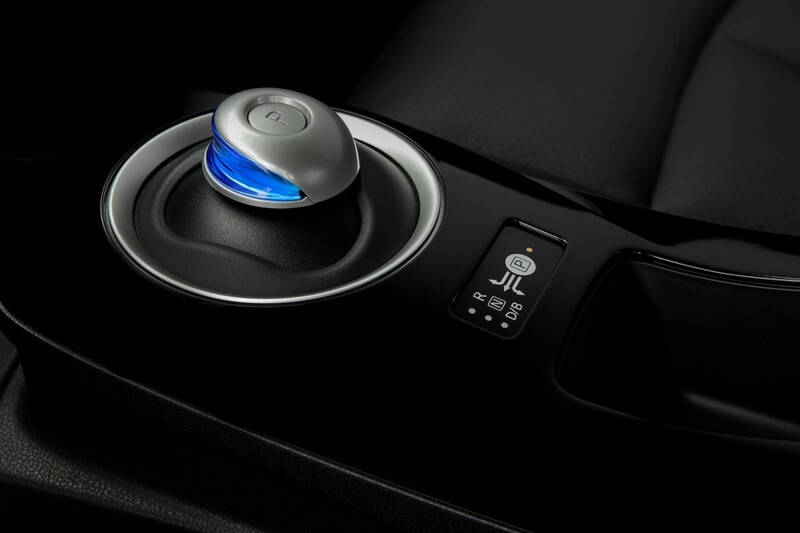 The charging port door up front is now lighted and lockable, and Nissan has added a driver-selectable “B” driving mode to that increases regenerative braking. 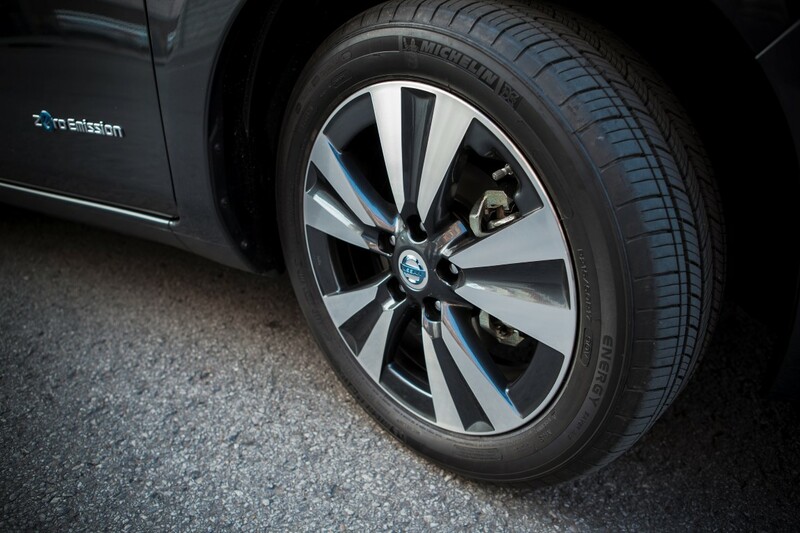 The 2013 model retains the same powertrain: an 80 kW (107 HP), 187 lb-ft motor driving the front wheels. 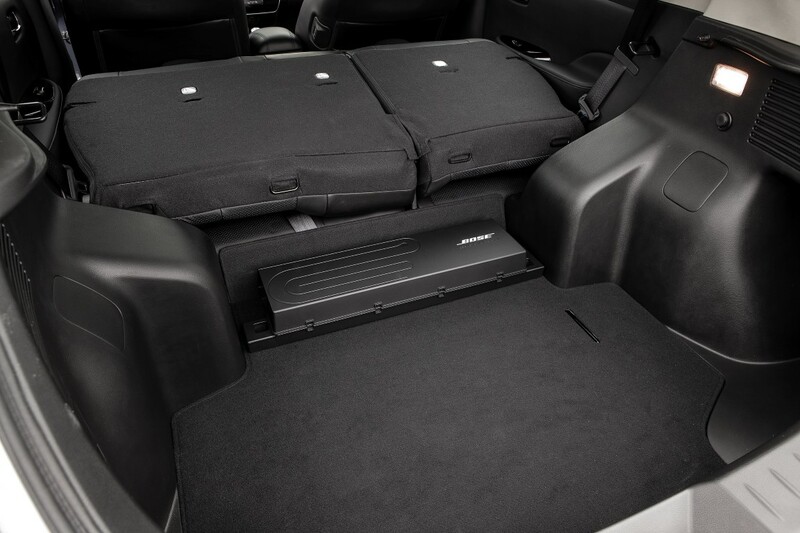 The battery pack remains at 24 kWh, but the onboard charger has been moved from the trunk area to the hood, getting rid of a hump in the rear cargo floor. 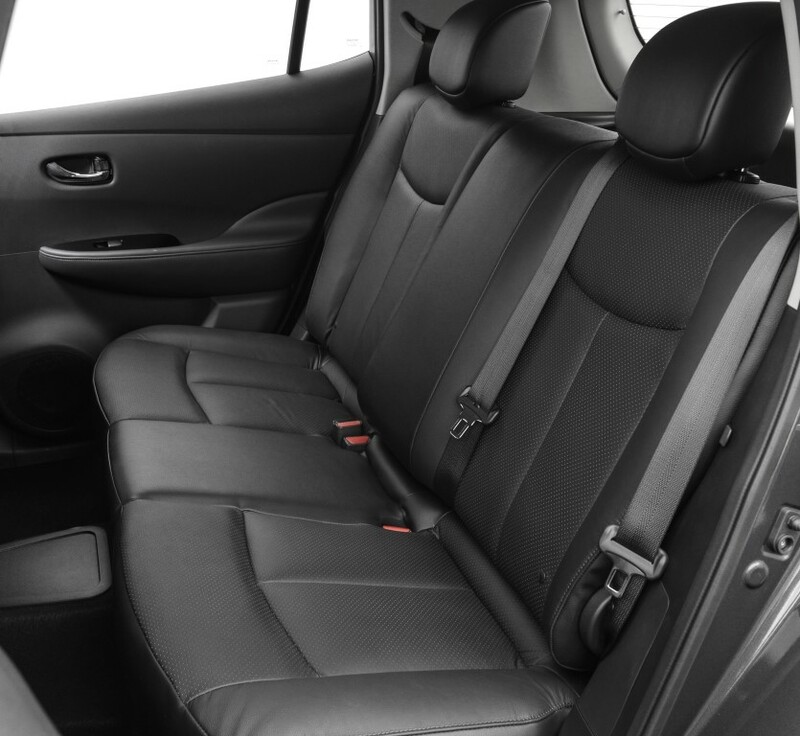 The new base-model LEAF S ($28,800 MSRP) has an 3.6 kW onboard charger, push button Start, Bluetooth phone system, power door locks, CD/MP3 player, and a 12V power outlet. No cruise control, though. 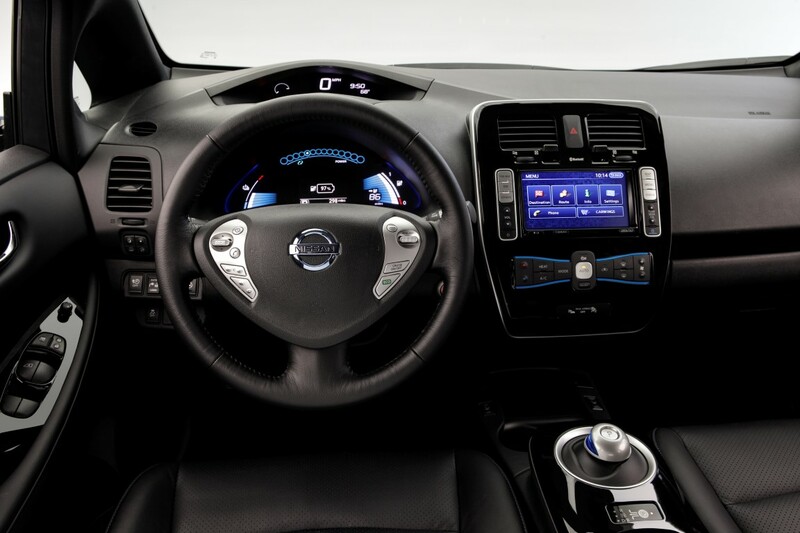 The LEAF SV ($31,820) adds cruise control, a 6.6 kW onboard charger, more efficient heating system, better sound system, 7″ LCD screen, GPS navigation system with CARWINGS telematics, and 16″ aluminum alloy wheels. The 2013 SV is $3,380 cheaper than the 2012 model. The top-end LEAF SL ($34,840) gets standard LED headlights, a 480V DC fast charge port, photovoltaic solar panel rear spoiler, leather seats, and redesigned 17″ alloy wheels — for $2,410 less than the 2012 SL. 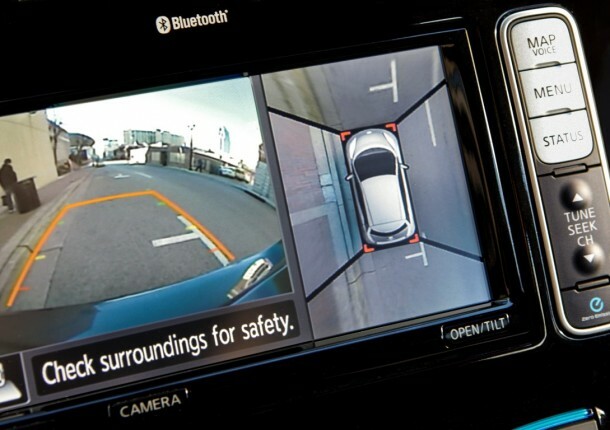 The SV and SL get an optional AroundView monitor system, which uses cameras around the car to create a top-down view of the car’s surroundings, and a 7-speaker energy-efficient audio system from Bose. 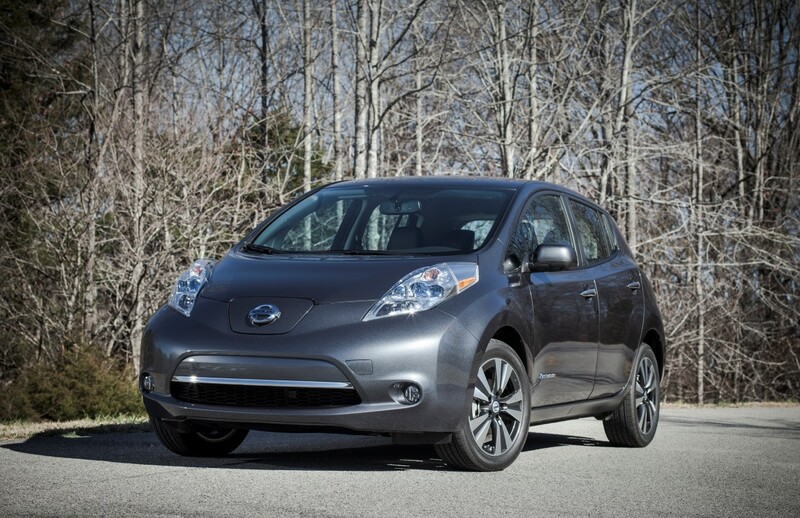 Nissan will also continue its incentivized lease offers on the 2013 Leaf, starting with a three-year lease at $199 per month. 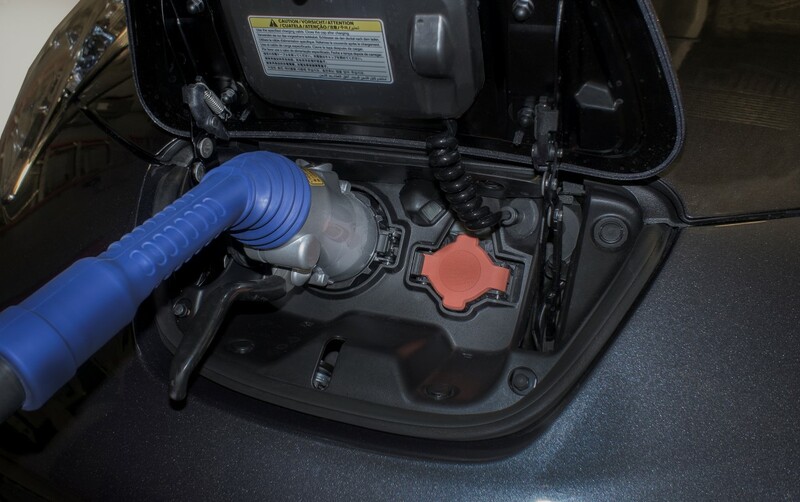 The new prices mean that the most expensive 2013 Leaf (SL, $34,840) is now cheaper than the cheapest 2012 model was (SV, $35,200)– and in California, which adds its own $2,500 EV tax credit on top of the $7,500 federal credit, the base Leaf S will cost just $18,800. 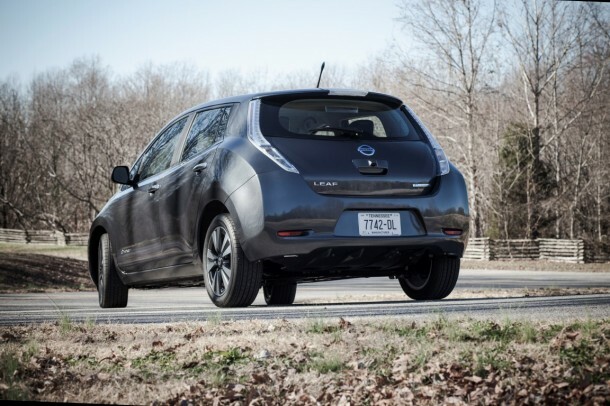 The 2013 Leaf should hit dealers by early February.